The democratization of the web platform has brought about an influx of JS alternatives - some of which will eventually overtake JS as the de-facto tool for writing user interfaces on the web. Since its inception, JS has continued to evolve; pushing the limits of what could be accomplished while also improving the ergonomics of the language by leaps and bounds. We're spoiled in this day and age when dealing with asynchronicity, but we all remember a time when callback-hell was the norm. The barrier to creating complex apps has progressively declined. But there are only so much changes one can make, and features one can add to a language, before any additions become only marginally beneficial. This is simply an economic law as real as the gravitational force. I think the last game-changing update to JS was async / await. Everything after that has been nice, but not revolutionary. In essence; JS will only get marginally better, but will stay fundamentally as it is for the foreseeable future. At its optimal state, JS is good to use, but it is not the tool to solve every conceivable task as some people are lead to believe. As JS apps got more and more ambitious, the need to manage software complexity increased. Unit tests are no longer enough. Linting is no longer enough. Out of this need, Flow and TypeScript emerged to help bring typesystems into JS, and hence help increase software correctness. Herein lies a hint that we've reached the limits of JS's capabilities. We're forcing types on an untyped language. And these aren't toy projects - there's a lot of demand for this featureset; just look at the downloads per day for each of the respective npm packages. This is the source code for a TS declaration file for a Google package w aprx. ~170,000 downs/mnth. Eventually people get lazy when writing these files and just start telling the compiler, "ahh don't worry about it!" 'any' types defeat the purpose of static typing. The above tweet represents the TypeScript ecosystem fairly in my opinion. The sheer amount of outdated or simply improperly written types is astounding. As I mentioned in the twitter thread: I would have considered contributing to the DefinitelyTyped project but from the looks of it, I get the impression that it's a lost cause. The prolific use of any in TypeScript is saddening. By using any you have thrown all type safety out the window. Now you're writing a Java-esque version of JS, that has some type safety but it's not guaranteed because of the any escape hatch. I think this is partly because of how fast the JS ecosystem moves: For every typedef written, 3 new packages come out and one week later the aforementioned typedef becomes outdated due to a major version bump (I am only estimating, so please correct me if I am way off). With this sort of pace it's impossible to keep up. The rationale becomes, "I'll fix the types later, but for now I'll just say everything is an any." So not only are typedefs either just wrong and littered with any, but they're also outdated. Sometimes by several versions. So here we are with a plethora of very large JS projects, and the current solution is to throw a type system on top of a dynamic language. This makes total sense for projects that are too large to undergo a total rewrite ... But what about all the smaller projects? Why not just use a whole other (better) language altogether? Nowadays there is lots of talk about functional programming. Many have realized the perils of object oriented architectures and we are slowly seeing a shift toward functional programming and stateless architectures. This shift isn't inherently bad for JS as it has FP features, however, most JS programmers have no idea how to code functionally. Further, much like in typescript, if you allow for escape hatches, you will use escape hatches. That is to say; if you can use a for loop to get a feature out quicker than thinking ahead of time of a more functional (and longer lasting) approach, then you'll eventually succumb to the temptation. Again, this is economics at play: It's much easier to follow the path of least resistance, and writing code imperatively generally requires less consideration. As mentioned above, the web platform's opening up to new languages is evidence of demand for better guarantees around software complexity. Now that there are capable alternatives to writing web applications in languages other than JS, we'll start seeing growing usage of these languages for serious projects. Most notably ReasonML within Facebook. These are the compile-to-JS languages that I'm aware of, and I'm sure there are many more which deserve a shot-out. The point being that there is clearly a trend here. Many people are unsatisfied with JS's ability to write complex software. That's not to say you can't write complex software in JS. It's just way harder to do so. "Oh you want to unit test? Well, just use mocha + chai + sinon. Or alternatively Jest. Or Ava. Or Tape. Or ..."
Which one is the right one? Only an expert JS dev could tell you. Are you using CommonJS or AMD modules? Are you transpiling your code? Which version of Node are you using? JS is a bit of a catch 22: It's probably one of the easiest languages to get started with, however its simplicity means that it's also one of the toughest languages to master. The amount of discipline and skill required to build a healthy and maintainable codebase is testament to this. The simplicity in getting started with JS defers complexity further down the time horizon. You'll shoot yourself in the foot sooner or later because there are basically no restrictions to what you can or cannot do in the language. And then you're left staring at a cesspool of code-smells with nothing to help you. Hmm, maybe JS isn't conducive to maintainability in the first place? Tell a novice JS dev, "write clean code" and let me know how that pans out. Conversely, writing in, say Elm or Rust is a lot saner. You have a compiler that helps you. It ensures that your code will run as you intend it to and it provides you feedback as you go. It's materially harder to write unclean code in many other languages relative to JS. Do you want to refactor a large chunk of your JS codebase? I sure hope you have written enough unit tests and your ESLint config is there to catch other errors (so much so that you've essentially done what a compiler would have done for you out of the box). You don't need to unit test your package / library before publishing it to npm. You also don't have a compiler in JS to provide guarantees that the package you wrote isn't going to crash. 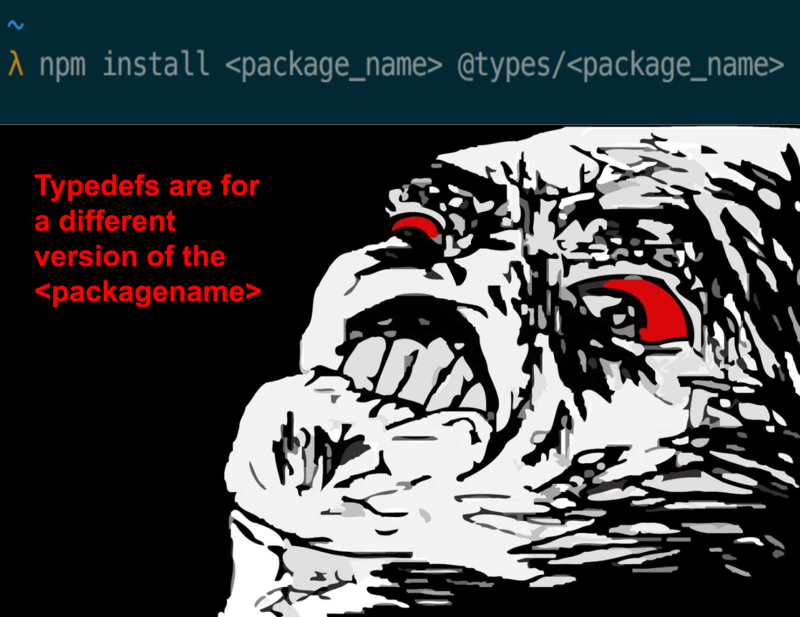 So the packages you download from npm are basically at your own peril. This is why you need a downloads counter in npm. The logic being, "If others are downloading this package, then surely it's safe to use". But obviously this is not always the case as edge cases often take a long time to surface. This is in stark contrast to any of the package ecosystems in strictly typed languages (crates.io, Hackage, Elm-Package, etc...). You don't need a downloads counter because you know the package had to be compiled before even landing on the package ecosystem. Consider pre-upload compilation a sort of litmus test which sets a consistent expectation of quality across the board. Another benefit with these other languages is that they are sustained by communities consisting of very skilled developers (the influx of devs coming from code bootcamps doesn't help alleviate the code quality problem plaguing npm). That's not to say that you don't have amazing devs in JS-land (you do), but the distribution of talent in JS has a massive standard deviation. This is known as equilibrium in economics and it's about time we reached it in the front end development ecosystem.